When the Deepwater Horizon drilling pipe blew out seven years ago, beginning the worst oil spill in U.S. history, those in charge of the recovery discovered a new wrinkle: the millions of gallons of oil bubbling from the sea floor weren’t all collecting on the surface where it could be skimmed or burned. Some of it was forming a plume and drifting through the ocean under the surface. Now, scientists have invented a new foam, called Oleo Sponge, that addresses this problem. The material not only easily absorbs oil from water, but is also reusable and can pull dispersed oil from the entire water column—not just the surface. When the Deepwater Horizon drilling pipe blew out seven years ago, beginning the worst oil spill in U.S. history, those in charge of the recovery discovered a new wrinkle: the millions of gallons of oil bubbling from the sea floor weren’t all collecting on the surface where it could be skimmed or burned. Some of it was forming a plume and drifting through the ocean under the surface. Now, scientists at the U.S. Department of Energy’s (DOE) Argonne National Laboratory have invented a new foam, called Oleo Sponge, that addresses this problem. The material not only easily absorbs oil from water, but is also reusable and can pull dispersed oil from the entire water column—not just the surface. ANL notes that we already have a library of molecules that can grab oil, but the problem is how to get them into a useful structure and bind them there permanently. The scientists started out with common polyurethane foam, used in everything from furniture cushions to home insulation. This foam has lots of nooks and crannies, like an English muffin, which could provide ample surface area to grab oil; but they needed to give the foam a new surface chemistry in order to firmly attach the oil-loving molecules. Previously, Darling and fellow Argonne chemist Jeff Elam had developed a technique called sequential infiltration synthesis, or SIS, which can be used to infuse hard metal oxide atoms within complicated nanostructures. After some trial and error, they found a way to adapt the technique to grow an extremely thin layer of metal oxide “primer” near the foam’s interior surfaces. This serves as the perfect glue for attaching the oil-loving molecules, which are deposited in a second step; they hold onto the metal oxide layer with one end and reach out to grab oil molecules with the other. The result is Oleo Sponge, a block of foam that easily adsorbs oil from the water. The material, which looks a bit like an outdoor seat cushion, can be wrung out to be reused—and the oil itself recovered. “The material is extremely sturdy. We’ve run dozens to hundreds of tests, wringing it out each time, and we have yet to see it break down at all,” Darling said. 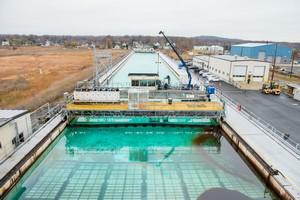 Oleo Sponge could potentially also be used routinely to clean harbors and ports, where diesel and oil tend to accumulate from ship traffic, said John Harvey, a business development executive with Argonne’s Technology Development and Commercialization division. Elam, Darling and the rest of the team are continuing to develop the technology. “The technique offers enormous flexibility, and can be adapted to other types of cleanup besides oil in seawater. You could attach a different molecule to grab any specific substance you need,” Elam said. The team is actively looking to commercialize the material, Harvey said.